THE BMW X7 IPERFORMANCE ARRIVING SOON. The impressive size of the BMW Concept X7 iPerformance makes it impossible to miss on arrival. However, the imposing scale is underpinned by a slimline design which leads the eye to an interior packed with technology and built for luxury. Starting from the front, the classic BMW double kidney grille and large air intakes give way to the elegant and flowing lines that slope over the panoramic glass roof, ultimately leading to the taught and narrow rear. Exaggerated contours accentuate the muscular proportions and continue the feeling of grandeur and dynamism the car was designed for. Strides in connectivity mean passengers in the BMW Concept X7 iPerformance can stay in touch with the outside world and with each other’s individual screens. One exceptional highlight: the transfer of messages is displayed by interacting strips of light that move through the interior from back to front along the doors. As to be expected, the BMW Concept X7 iPerformance exudes comfort and opulence. The large spacious cabin with its handcrafted leather seats, intuitive console and panelling is finished in the highest quality materials. Generously dimensioned windows provide a feeling of openness which invites the outside in. Finishing off the cabin is the interactive and atmospheric lighting concept which adds to the luxurious character. 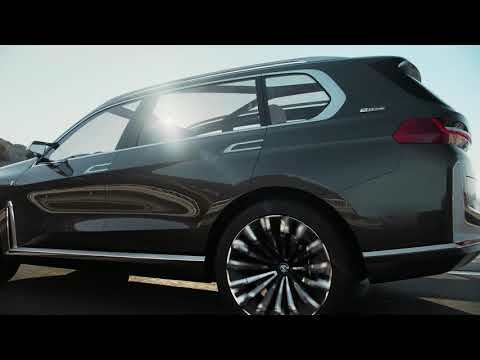 Register your interest today for the BMW X7 iPerformance concept.